1. Another Day (McCartney) 3:43 From the single Another Day / Oh Woman, Oh Why? (Apple R 5889). Released February 19, 1971. 2. Silly Love Songs (McCartney) 5:53 From the album WINGS AT THE SPEED OF SOUND (Capitol PAS 10010). Released March 26, 1976. 3. 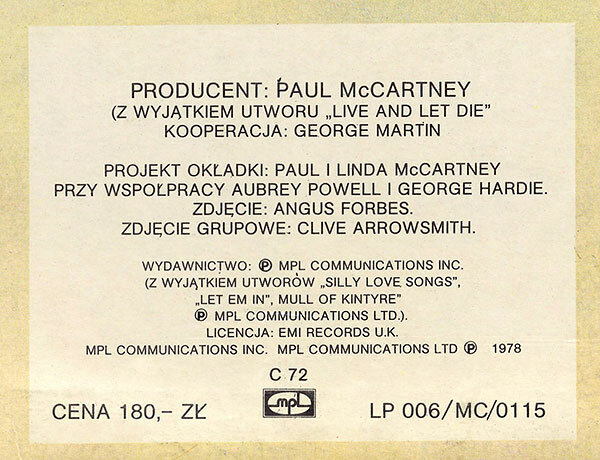 Live And Let Die (McCartney) 3:11 From the single Live And Let Die / I Lie Around (Apple R 5987). Released June 1, 1973. 4. Junior's Farm (McCartney) 4:21 From the single Junior's Farm / Sally G (Apple R 5999). Released October 25, 1974. 5. With A Little Luck (McCartney) 5:45 From the album WINGS AT THE SPEED OF SOUND (Capitol PAS 10010). Released March 26, 1976. 6. Band On The Run (McCartney) 5:11 From the album BAND ON THE RUN (Apple PAS 10007). 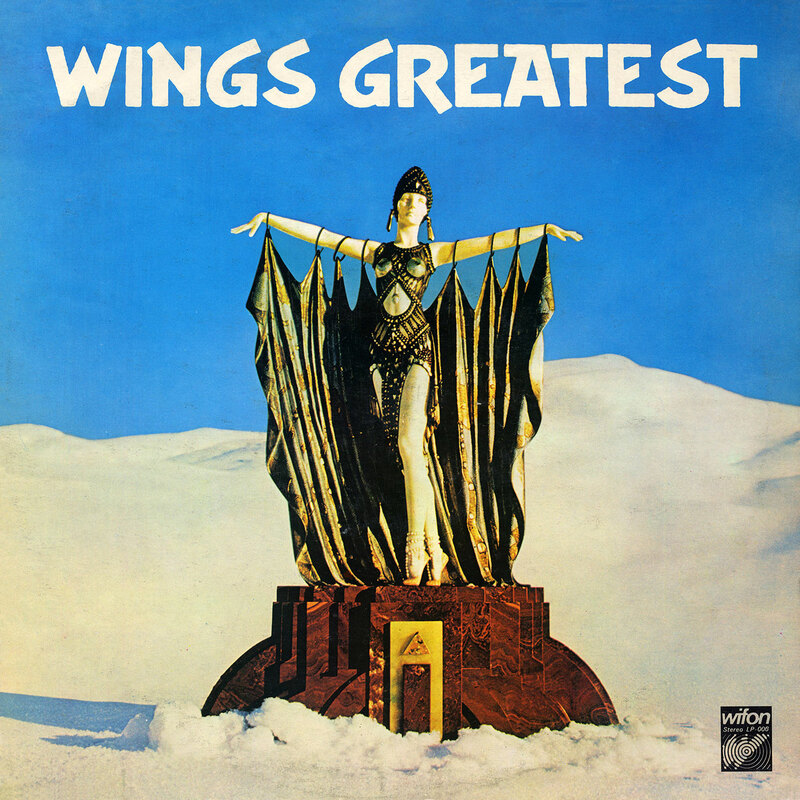 Released December 7, 1973. 1. 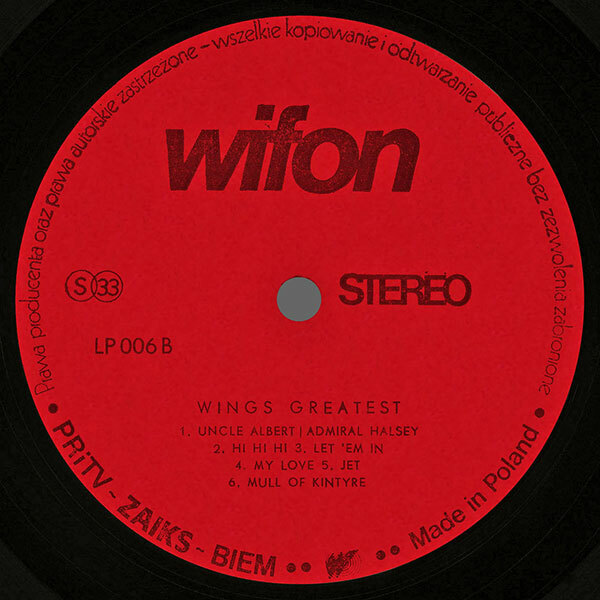 Uncle Albert / Admiral Halsey (McCartney) 4:41 From the album RAM (Apple PAS 10003). Released May 28, 1971. 2. Hi, Hi, Hi (McCartney) 3:08 From the single Hi, Hi, Hi / C Moon (Apple R 5973). Released December 1, 1972. 3. Let 'Em In (McCartney) 5:08 From the album WINGS AT THE SPEED OF SOUND (Capitol PAS 10010). Released March 26, 1976. 4. My Love (McCartney) 4:08 From the album RED ROSE SPEEDWAY (Apple PCTC 251). Released May 4, 1974. 5. 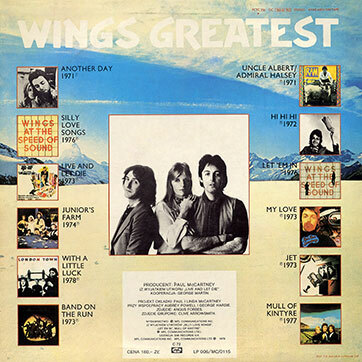 Jet (McCartney) 4:07 From the album BAND ON THE RUN (Apple PAS 10007). Released December 7, 1973. 6. Mull Of Kintyre (McCartney-Laine) 4:44 From the single Mull Of Kintyre / Girls' School (Capitol R 6018). Released November 11, 1977. This Polish edition is a copy of the British version with a slightly modified design of cover [see Pic. 1-2]. 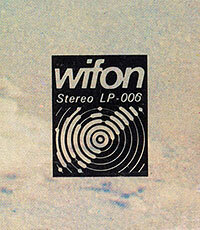 The record was issued under license from the company EMI RECORDS UK and cost 180 PLN. Рис. 1. Обложка, лицевая сторона (фрагмент, правый нижний угол) с логотипом фирмы "Wifon"
Это польское издание представляет собой копию британской версии с незначительным изменённым дизайном обложки [см. Рис. 1-2]. Пластинка была издана по лицензии компании EMI RECORDS UK и стоила 180 польских злотых.